Despite an early win and what has in many ways has been a simpler story, the Republican presumptive nominee John McCain has had a harder time controlling his personal narrative. Heading into the general election, there is a sense that much remains yet to be explored. Overall, from January 1 through March 9, 2008, the coverage of his master narrative was 57% negative versus 43% positive. Within that battle, one criticism has proved particularly persistent. Claims that he is not a reliable conservative and may alienate the conservative core of the party accounted for fully half of all threads studied during this time (and 88% of the all negative threads). It is a not a new problem. Throughout the pre-primary period and even during his 2000 presidential bid, McCain’s reputation as a political maverick put distance between him and the Republican Party. Partisans were especially critical of his successful sponsorship of campaign finance reform. What’s more, McCain did not have strong ties to the conservative religious groups that were considered essential for the Republican nomination. The two other prominent criticisms played a much smaller role in the McCain narrative. Claims that the 71 year-old is too old for the job accounted for a mere 2% of the personal themes during this time. And, despite a front-page New York Times article about past displays of his strong temper (as well as a possible extra-marital affair with a lobbyist), assertions criticizing his temper similarly amounted to just 2% of all prominent personal themes studied in the press. Nevertheless, the one criticism that stuck—his questionable conservatism—was hard to get away from. Attempts by the McCain campaign and his supporters to quell charges of him as an unreliable conservative got little traction in the press. In the end, the rebuttals amounted to a mere 9% of all assertions studied, meaning they were outdone by the negative assertions on this theme by six to one. The campaign had better luck with a more specific counter-argument—that McCain’s appeal to moderates gives him the strongest chance of winning in November. That assertion accounted for 14% of all threads studied. The positive narrative about McCain that gained the most traction as the primary season unfolded was the idea that he was a person of admirable character (19%), a trait he established even in his 2004 presidential bid. 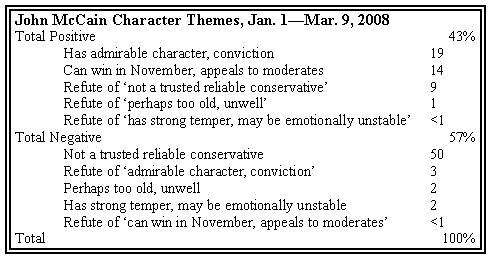 For John McCain, we conducted an additional analysis of his personal messages in 2007—the period that some observers call the “media primary.” During this time, the idea that McCain is not a reliable conservative was already well-established, accounting for roughly a third (32%) of the assertions about him. That was more than the press attention devoted to his admirable character (24%) and twice that of the second most popular negative message—that he is too old to serve as president (14 %). Over the course of the year, however, coverage of his personal narrative shifted, becoming more positive as the field of Republican nominees winnowed. 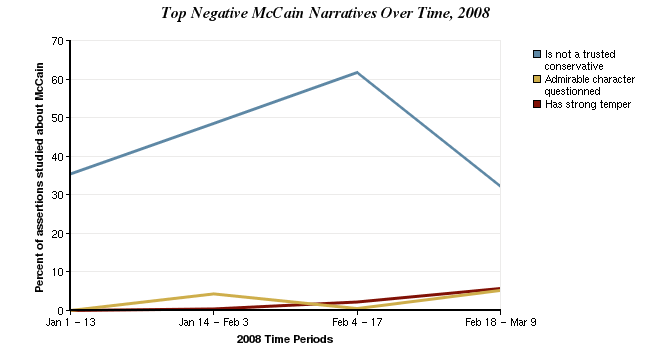 Looking across 2007, questions about McCain’s ideological stance remained around 30% of the assertions studied during the first half of the year. They then rose sharply to 43% during the summer when Republicans were tantalized with the possibility of a Fred Thompson candidacy. But there was a significant about-face in September, when the conservative flirtation with Thompson faded. In the final three months of the year—October through December 2007—the media messages doubting McCain’s conservative credentials dropped to only 21% of assertions about him. Likewise the concerns about McCain’s age declined dramatically from 29% in the first quarter of 2007 to a flat zero by the last three months of the year. In the meantime, the positive views of McCain as a person of strong character more than quadrupled in attention. While this positive narrative amounted to only 10% of the personal assessments of McCain in the first quarter of 2007, they doubled in the second quarter, rose to 34% in the third quarter and increased to a whopping 44% in the last quarter. 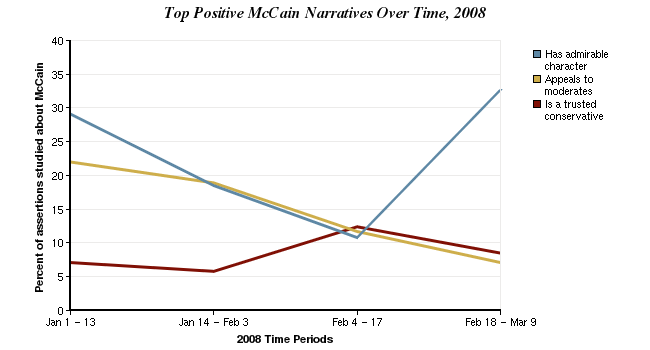 In other words, by the time the early caucuses and primaries rolled around, the overall balance of McCain’s narrative was reversed—from 31% positive in the first quarter to a dramatic 71% positive in the last quarter of 2007. The sense of McCain’s admirable character mitigated the negative ideological trope, and his age all but disappeared as an issue. The stage was set for the primaries with a robust media endorsement of McCain’s personal character. As 2008 dawned, McCain entered the primaries with solid control over his personal narrative. In particular, he managed to project the idea of his unwavering character to help battle continuing ideological concerns. February 18—March 9: The weeks following the New York Times front-page article questioning McCain’s character. On January 8, McCain earned a strong win in New Hampshire. Anointed the Republican “Comeback Kid” by some in the press, he was also anointed with a more favorable image in the coverage of his character. Of the personal narratives studied about McCain, 62% were positive in the first two weeks of January. This was driven by a heavy presence of statements about his admirable character (29% of assertions during this time) as well as his ability to appeal to moderates (22%). Questions about his conservatism still represented the largest theme (35% of assertions), but the combination of positive messages outweighed the negative during this time. The ride didn’t last long. In mid-January, a quick Romney rebound in Michigan (January 15) began to shift the balance. From January 14 through February 3, the negative narratives took hold, outpacing the positive 56% to 44%. Questions about his conservatism rose to roughly half (48%) of all assertions studied while the most prevalent positive messages fell to 19%. Through mid-February, McCain continued to lose control of the personal narrative, despite his electoral success. During this period, negative messages reached the highest level of any candidate during this study (65% negative). Despite strong wins on Super Tuesday, which cemented his lead and led to a Romney withdraw (February 7), the battle for positive personal coverage proved elusive. Questions about McCain’s conservative credentials shot to nearly two-thirds (62%) of the personal assertions about the GOP candidate during this time. McCain supporters amped up their defense and managed to double the presence of rebuttals to this charge (12% versus 6% in the previous time period). That still meant that doubts about McCain’s conservatism outweighed defenses of it by roughly five to one. McCain battled on, however, and by early March, now the presumptive nominee, he moved the marker back to the mid-line with a roughly 50-50 split between positive and negative personal narratives from February 18—March 9. During these weeks, the McCain campaign was able to combat a February 21 New York Times story citing lapses in ethics and self-control. It also managed to triple references to his conviction and strong character, reaching 33% of all threads studied (up from 11% in Mid-February), even outpacing (albeit barely) questions of his conservatism (32%). As McCain ducked onto the sidelines to watch Clinton and Obama duke it out, he was at least on an even keel, having once again proven his comeback ability.